Egyptians 'STOLE' pyramids: Historian claims ANOTHER civilization built Giza complex. STOLEN: Matt Sibson believes the hard work was taken over by Egyptians years later (Pic: GETTY). THE Pyramids of Giza may have been built thousands of years before they were discovered by Egyptians, according to a Brit historian. The archaeological site – located on the outskirts of Cairo, Egypt – includes three pyramids and the Great Sphinx. But new evidence could prove they were actually built more than 5,000 years earlier than records suggest, according to historian Matt Sibson. “But there is no evidence that Egyptians actually built them”. Matt Sibson. 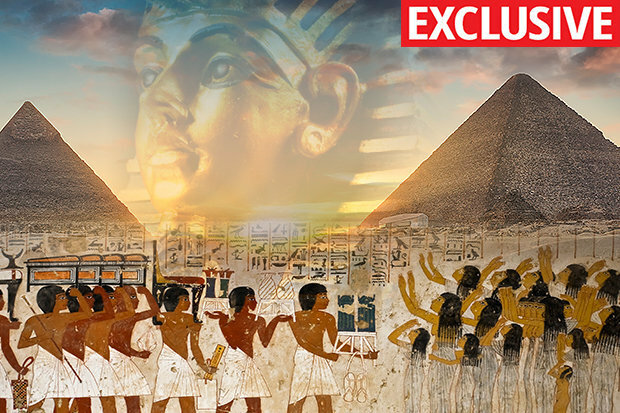 “The Egyptians may have discovered these pyramids and had no idea what they even were,” he told Daily Star Online. “There is no proof they went inside – they did not leave their carvings or anything, which is odd. “When people finally went inside in the 9th century they reported finding nothing. “So they are probably older structures than textbooks say. Matt bases his evidence on a discovery he made on a wall around the second structure – the pyramid of Khafre. He told Daily Star Online: “The wall looks flat and natural, but if you look at one corner in the southwest, it looks like it has been plastered over with clay. “And where the smooth finish dies away, you’re left with a very, very weathered wall. And Matt, from Leicester, believes the hard work could have actually been completed some 5,500 years earlier. He explained: “We can see rain erosion on the wall, but geologists say there was no rain heavy enough to cause such damage at the time (2,570BC). "It was around 5,500 years earlier – roughly 8,000BC – where the rain matched that needed for the erosion." The 36-year-old researcher shared his incredible finding with his 165,000 strong fanbase on his YouTube channel… (By Callum Hoare).